The Green Biscuit slides THE BEST on almost any surface. You can use it outside on cement or ashphalt and it works better than any other off-ice puck I have tried. The Green Biscuit sells for $12.95, you can get discounts if you buy in bulk. I recommend buying a few so you can have one in your hockey bag, one at home, and a backup in case you lose or break one. In this video I tested out the Green Biscuit, I meant for it to be a review, but I just loved the thing so much I kind of turned it into a commercial, haha. Seriously though, every hockey player should own one of these! On Amazon it has 24 5 star reviews and 3 4 star reviews. From my own experience the only disadvantage is that you should not shoot it (it could break) and it’s loud. The green biscuit is the exact same size as a regular hockey puck, however slightly lighter. The green biscuit is made lighter than a normal puck because of the added friction of rough surfaces. 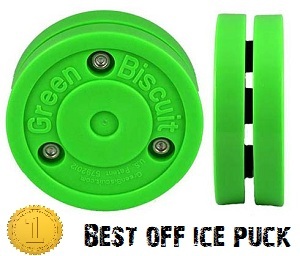 The increased friction makes the green biscuit feel heavier, thus a lighter off ice puck will better match the feel of a regular puck on the ice. If you would like to purchase the green biscuit then visit the hockey shot site. do you deliver these to europe,finland? Omat kävin hakemassa Vantaan Hockey Basesta. Probably not, they take quite a bit of abuse to break. It might break eventually but you should get a lot of life out of it. Which one slides better on concrete, flypuck or green biscuit???? does green biscuit slide better than the green biscuit snipe? Yes, it slides a little bit better. The Green Biscuit Snipe is more durable though and holds up better to shooting. Jeremy any reviews on the new green biscuit that’s out? I’m just waiting for the weather to clear up a bit so I can test them when it’s a bit warmer out. where can I buy a green biscuit because I realy want one!! When my family plays roller hockey on our driveway we like to use that to play with because it is great for stickhandling on the rough cement. We dont shoot high because we dont wear breezers or shoulder pads, so it is great for shooting on the ground! Will the green biscuit break if it hits the post or a wall really hard. Is the green biscuit for shooting to or just stick handling and passing? I live in Latvia, is it a problem, can i get on off the biscuits? Really liked the green biscuit, and want to order one. But i live in Norway, is that a problem? My green biscuit just shiped today and it is AWESOME! I definately recomend this puck for every hockey player that can’t get on the ice everyday. I have been testing it on a lot of surfaces just to break it in a little. This puck still slides smooth on any surface I can think of! The downsides I found were: your cant shoot it :(, it flips over if you stick handle the wrong way ( wich is easy to prevent ) and I really don’t think its loud. On asphalt it works so good. ( im not kidding ). Overall, this puck works on ANY surface, I would recomend this to every hockey player and Jeremy, great videos I love how you stay true to your customers. Thanks Josh, I just shared this on our facebook page! Jeremy, GREAT puck, great review, love the video it made me buy it. I have to say as someone that lives in the desert with not many options for local ice that this green biscuit is BY FAR the best at managing rough surfaces. It feels as close to a real puck as you can get, and THANK GOD it doesn’t roll…I have tried every puck that claims what the Biscuit does and none have impressed me more. haha good go buy one! they work great! That is one awesome puck! If you play with the puck on the driveway it feels like a real puck on the ice! Stickhandeling with the green biscuit is really going to help you in a game! wow that sounds awsome cali ! i think i will buy one! just wanted to say that your tips have really improved my game. i used to be a 45 point getter and now i am a 70 point getter. I was looking dor a green biscuit in surrey which I cant seem to find.Do you know where I can get one?And can the green biscuit be used in wristshots,snapshots,and slapshots?If not,do you know a type of puck like the green biscuit that can be used for slapshots ect. Hi can u slap shot the green biscuit? Hey can you make a video that shows you using the green biscuit on the shooting pad, and off the shooting pad? That would be a big help. Thanks! Hey again does the fly puck work as well as the green biscuit? I have tested a lot of training pucks and in my opinion the Green Biscuit is the best. The Green Biscuit slides the best on rough surfaces. Thanks I will buy more probaly because I use it so much . hey i got it like 4 months a go and i am a peewee AAA player and i use it every day for 5 hrs and it is chipping. Is that normal for it the chip like that ? Hi Dan, thanks for your comment. That is great that you are getting a lot of use from the Green Biscuit. It is normal for it to chip with extended use, if you use it a lot on a rough surface the plastic will wear down after a while. Every day for 5 hrs is quite a bit of use, maybe next time you can order a few so you have back-up! Also don’t shoot the puck at all because it will break. How is the green biscuit on the shooting pad? Which do you prefer, the green biscuit or a regular puck on the shooting pad? I’m working on stickhandling on the pad, not much room to shoot around here. The Biscuit is awesome on the shooting pad. For real quick movements I always use the Green Biscuit, it slides even better than a puck, and it’s a bit lighter so it feels more like a puck does on the ice. I like to switch back and forth, and I also use a weighted puck. where do u get the green biscuit? Hey Carson, the link is just above your comment under the ORDER INFO heading. Just click the link and you can order them. I’m not to sure what stores carry them.